I used Lee Filter’s Big Stopper and a ND6, which both work with their core 100mm system and is a fine product. The big stopper is 10 steps and the ND6 is another 6 steps. I suggest you use a 13 step filter but I wanted to try using the Lee Filters I owned. 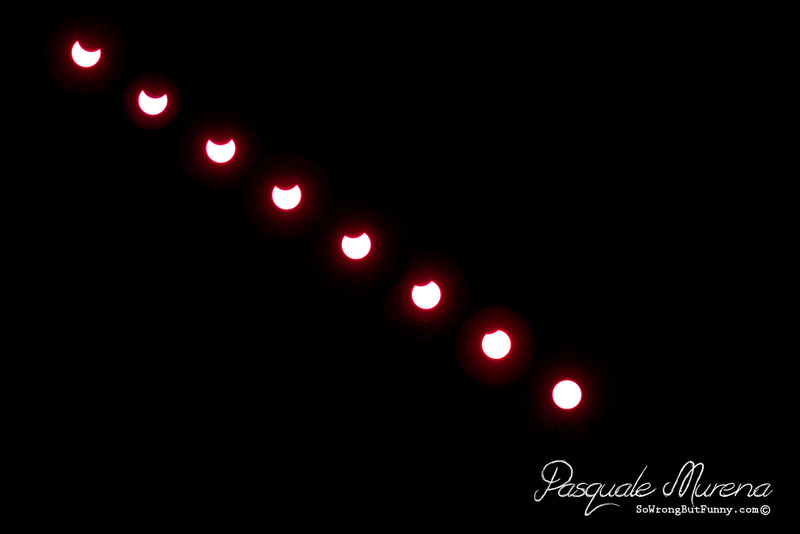 The top left photo is the eclipse at its fullest for the partial eclipse. Then I took a photo every 10 minutes until it went back to a normal full sun. Solar eclipses happen when the moon passes between us and the view of the sun, I am saying us because I hope all my readers are from the planet Earth, if not I mean between the Earth and the Sun. In 2015 the North American continent will not see an eclipse but on March 20th Europe, North Africa and North Asia will see a full Solar Eclipse and on September 13th South Africa and South India will see a partial eclipse. The next solar eclipse North America will see is on August 21, 2017 but it is a full Eclipse so that is going to be worth the wait. Remember to not use the Big Stopper to view the sun with your eyes, you can permanently damage your eyes even with this piece of glass. Get yourself some welding goggles and practice safety especially with kids.